How many birthday parties does your child attend each year? At least one a month? More? That’s a lot of birthday presents to think about! I bet that quite often, inspiration fails you as you stand in the toy shop or browse Amazon. That’s why we’ve put together our top ten recommendations for children’s birthday presents so that you need never be stuck for an idea again. Games are great in so many ways. They reinforce turn taking, social skills, counting, and they’re great fun too! Another good thing about travel games is you can take them anywhere – on holiday, to a restaurant, to Granny’s! 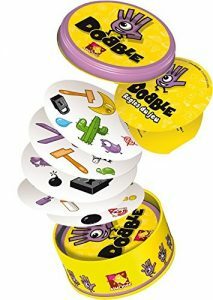 One of our favourites is Dobble. Really easy for all the family to play and lots of different versions to keep the interest going after multiple plays. Many parents will remember the fun they had playing with dress-up dolls as a child. Well now, Melissa and Doug produce a great range of wooden, magnetic, dress-up doll sets. Durable and suitable for boys and girls, their sets have a whole range of dress-up “clothes” that are very portable too. Melissa and Doug products are beautifully made and great value too. Anything that gets kids moving is always good, so why not encourage that with a sporty gift? This site has croquet sets, stilts, pocket kites and indoor skates! We’ve all heard that cry “Are we there yet?” on a long journey. 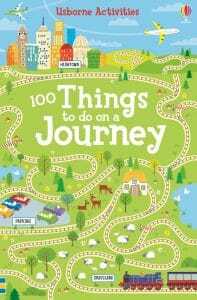 These packs from Usborne Books are great for journeys and are great value too. Lots of activities for all ages to do in situations where you might not have much space too. Kids love a trip to the cinema but it can work out expensive. A cinema gift card can be a lovely gift for a child, and most can be spent on either tickets or snacks once there. Here are the ones available from Vue cinemas. If you think you may have a budding children’s entertainer on your hands, then a balloon modelling kit could be a great present. We like this one as it comes with a pump and stickers to turn your models into animals. The children always love a good boogie at the parties we attend, so why not help them continue the party at home with a great pop party CD? We think this one has most of the top tracks covered – Now That’s What I Call Pop! It’s always exciting to get mail as a kid, so how about giving them a magazine subscription so they have something to open every month? Magazine.co.uk has lots of choice for all ages. 9. Star in Your Own Book! 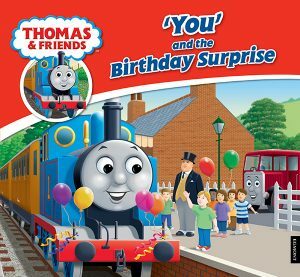 A personalised book that has the child as the central character is a really unique gift. Even better if they get to feature with their favourite character. Egmont Books have a great selection and usually a quick turnaround on orders. Finally, this is a great site with some really quirky ideas to suit all budgets. From bath bomb making kits, personalised goodies, craft kits and lots more, Prezzybox is definitely a site you need to bookmark. We hope these ideas fill you with inspiration for the upcoming birthday parties you have in your diary. And do let us know if you have any fail-safe ideas for birthday party presents too.